Do you guys love brown butter as much as I do?! I think that it has such a warm and cozy taste that's perfect for this time of year! I've never incorporated it into a dessert before but now that I have, I can never go back. This cake is decadent and easy on the eyes! Preheat oven to 350° F (180°C). Spray the bottom of three 8-inch round cake pans with cooking spray and line bottoms with parchment rounds. Set aside. In a large mixing bowl, sift flour, sugar, cocoa powder, baking soda, baking powder, and salt. In a medium bowl or measuring cup, combine the buttermilk, coffee, oil, and vanilla, and then mix in eggs. Add liquid mixture to dry ingredients and whisk until smooth, about 1 minute. Divide batter equally among the three cake pans or weigh for accuracy--each pan should weigh about 580 grams. Bake the first two layers until a wooden pick inserted into the centre of the cake comes out with a only a few crumbs, about 23 minutes. Try not to over-bake. Let cakes cool in pans on a wire rack for 10 minutes, and then turn onto rack to cool completely. Repeat with the final cake layer. When ready to assemble the cake, wrap the layers in plastic wrap and chill for about 30 minutes. Heat a pot over medium heat. Once it is hot, add the butter. Whisk the butter constantly to prevent it from burning. Some brown specks will form at the bottom of the pan and a nutty, rich scent will begin. Once this aroma becomes fragrant and the color of the butter turns a light tan (shortly after the first brown specks appear), remove it from the heat. Pour the brown butter into a bowl and set it aside so that it can cool to room temperature. Once it is at room temperature, place it in the refrigerator for 15-20 minutes so that it can become more of a solid. Then, remove it from the refrigerator and let it sit for a couple of minutes. Beat the butter in a medium bowl on high speed with an electric mixer until it is creamy. Lower the speed to 'low' and add in the sugar and spices. Beat until all of the sugar is mixed in and then add in the vanilla extract. Beat on 'high' speed for 2-3 minutes until it is fluffy and creamy. If it seems too thick, add in a tablespoon of milk at a time and beat for 1-2 minutes. Frost the top of each layer of cake and then stack them. Combine the sugar and cinnamon. Run rosemary sprigs under water and then gently pat them with a paper towel to absorb a little bit of the water. Pour the sugar mixture onto a flat surface (I used a large plate) and then roll the rosemary in the sugar mixture so that it covers the leaves of the rosemary. 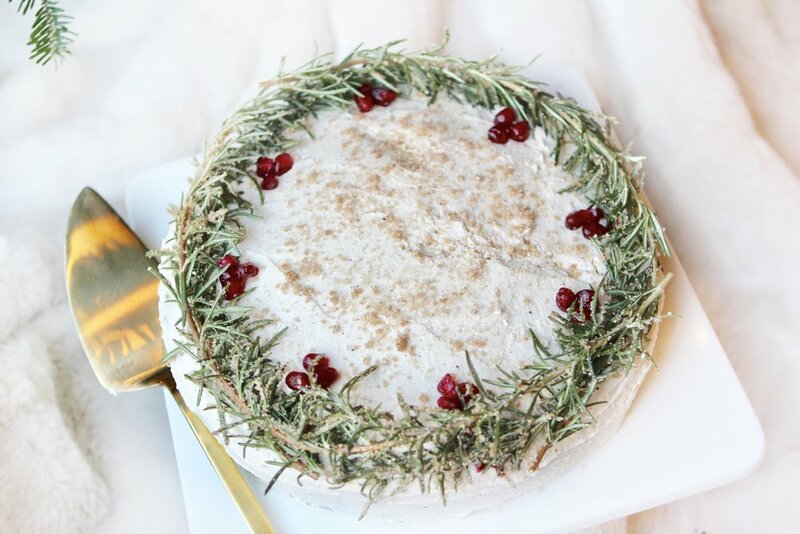 Lay rosemary sprigs in a circle on the top layer of the cake. Garnish with little clusters of pomegranate seeds. Sprinkle it on the top layer of the cake.